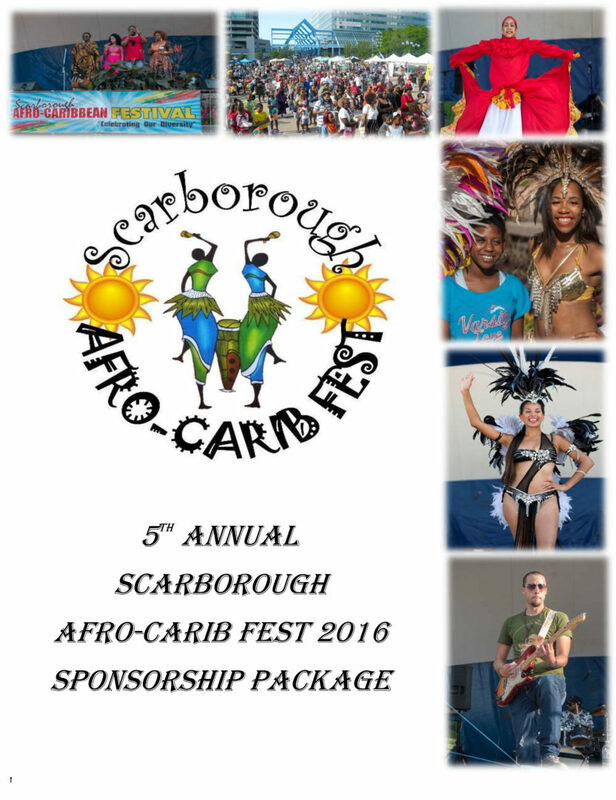 “Celebrating our Diversity” at the Scarborough Afro-Carib Fest this summer! It’s BACK!! It’s BIGGER!! It’s BETTER!! 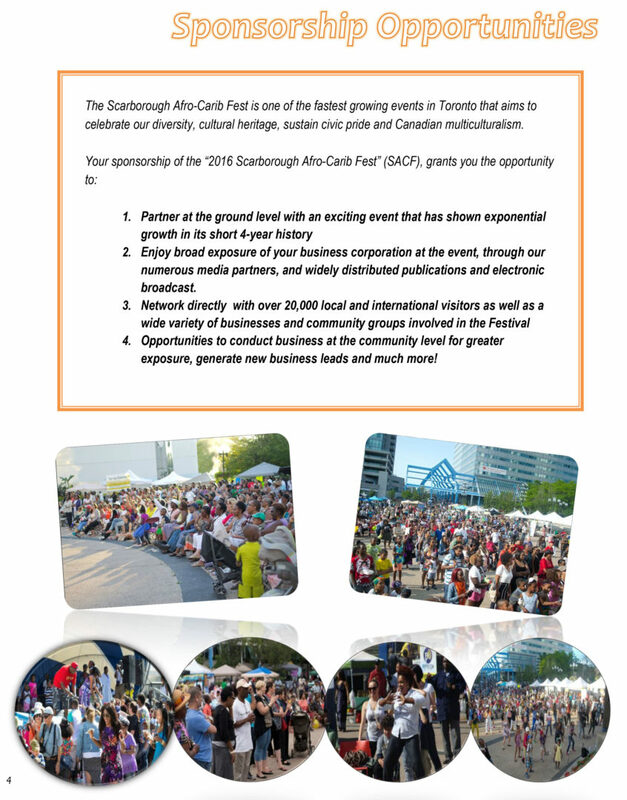 The 6th annual Scarborough Afro-Carib Fest, taking place on August 26-27, 2017 inside Albert Campbell Square at the Scarborough Civic Centre, brings you live musical performances, exciting entertainment from local and international artists, mouth-watering ethnic cuisine, dance competitions, vendor exhibitions and marketplace, cultural fashion show, drum and dance workshops, kid’s zone and much more! 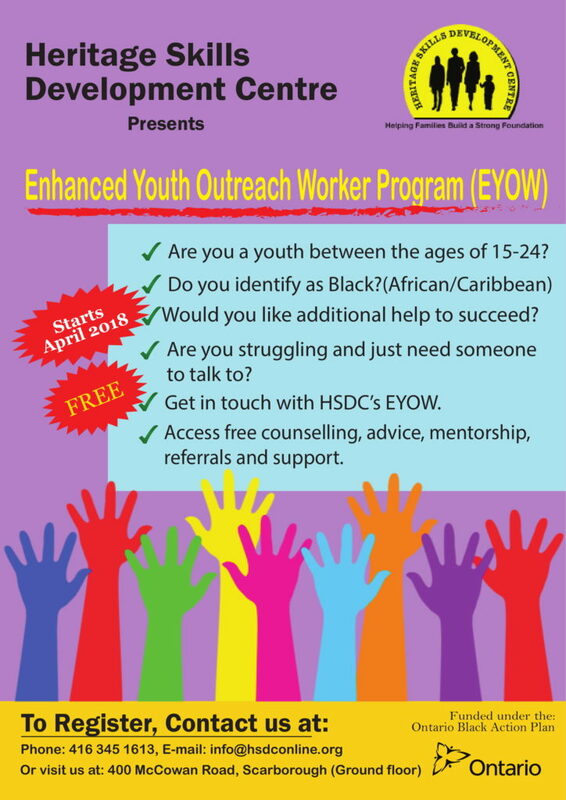 Presented by Heritage Skills Development Centre (HSDC) with support from the Government of Ontario, the event fosters civic pride and demonstrates the richness of the Afro-Caribbean cultures and other ethnic groups that make up the fabric of Canada. 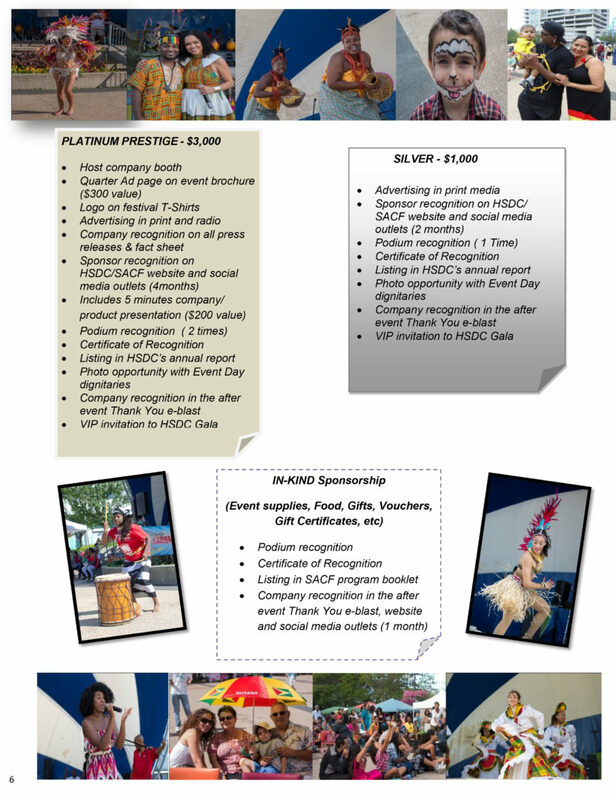 Uniquely Canadian, the Scarborough Afro-Carib Fest merges two rich cultures; African and Caribbean, in an effort to build community, bridge social, cultural and economic gaps through sharing music, dance, cuisine, arts and culture. 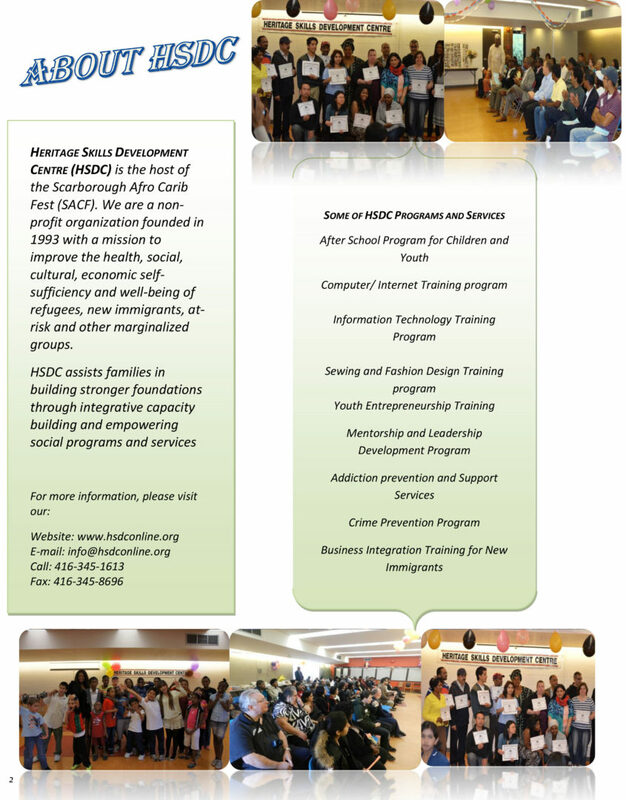 HSDC is a grassroots non-profit organization established in 1993 to promote the health, social, cultural, and economic self-sufficiency of new immigrants, low-income, at-risk and marginalized groups in the Greater Toronto Area (GTA). For information about HSDC, please visit: www.hsdconline.org. 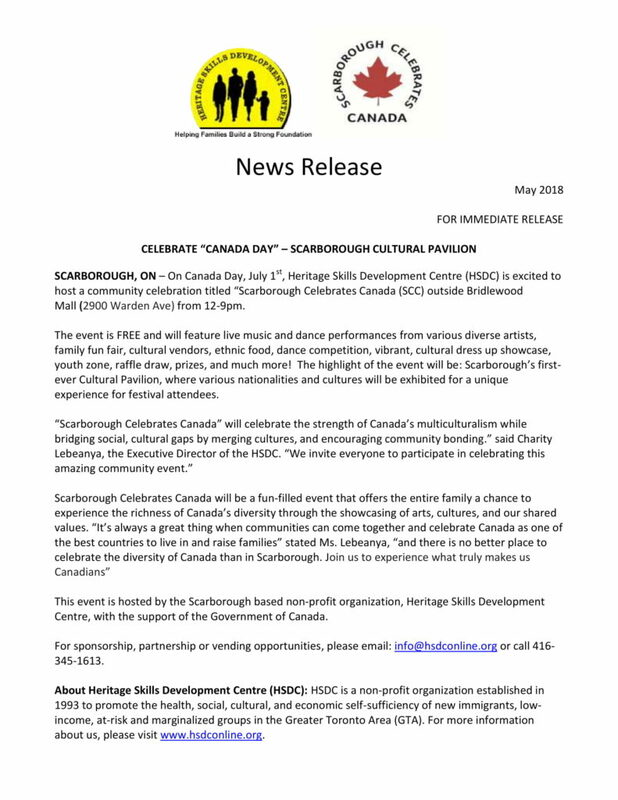 In commemoration of Canada’s 150th anniversary, Heritage Skills Development Centre (HSDC) introduces “Scarborough Celebrates Ontario”; a fun filled weekend event that offers the entire family a chance to experience the richness of our heritage through the celebration of arts, history, culture, our shared values and uniqueness. This FREE festival will take place on Saturday, July 15 and Sunday, July 16, 2017 from 12pm – 9pm at the Albert Campbell Square, Scarborough Civic Centre. The event aims to celebrate the diversity and cultural richness of Canadians from various ethnic groups and cultural backgrounds. 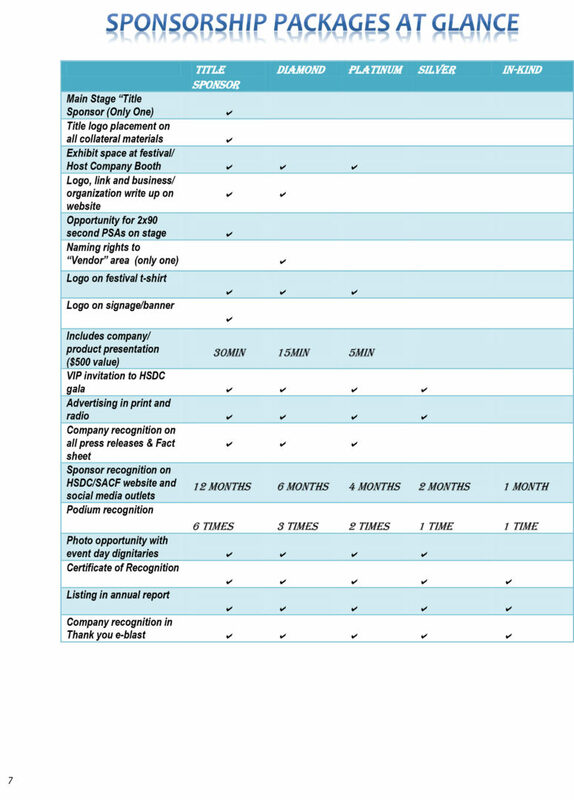 This exciting weekend multicultural festival is supported by the Government of Ontario and will include live musical performances from diverse Canadian artists, dance performances, exciting entertainment, international cuisine, vendor exhibitions, Kids Zone, interactive activities for the entire family, networking opportunities and much more! SCARBOROUGH, ON- On Wednesday April 26, 2017, Heritage Skills Development Centre (HSDC) received the June Callwood Award for Excellence in Volunteer Management from the Ministry of Citizenship and Immigration. 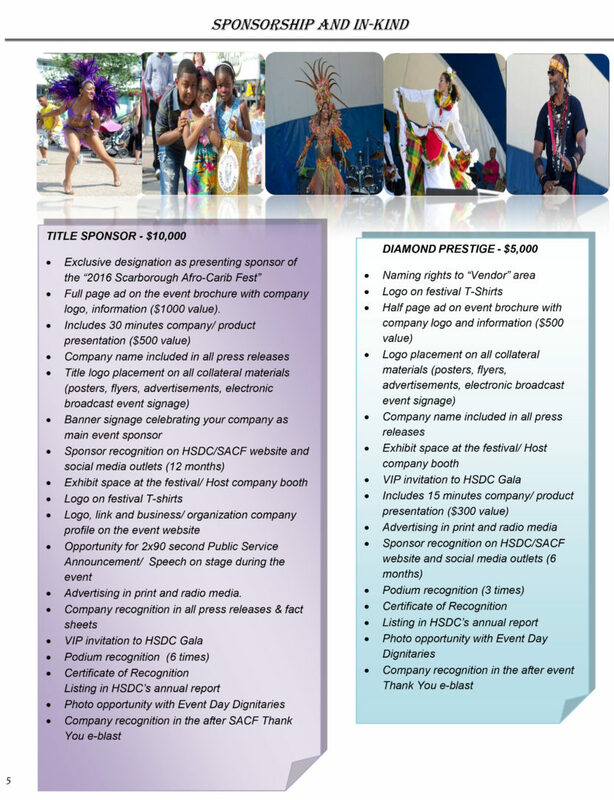 The award was given to HSDC who hosts the Scarborough Afro-Carib Fest over the last five years, which is now one of the fastest growing multicultural festivals in Toronto. The event engages over 50 volunteers annually and attracts over 20,000 people from across Canada and the world. The festival invites individuals of all ages and backgrounds to experience the richness of Toronto’s diverse communities. 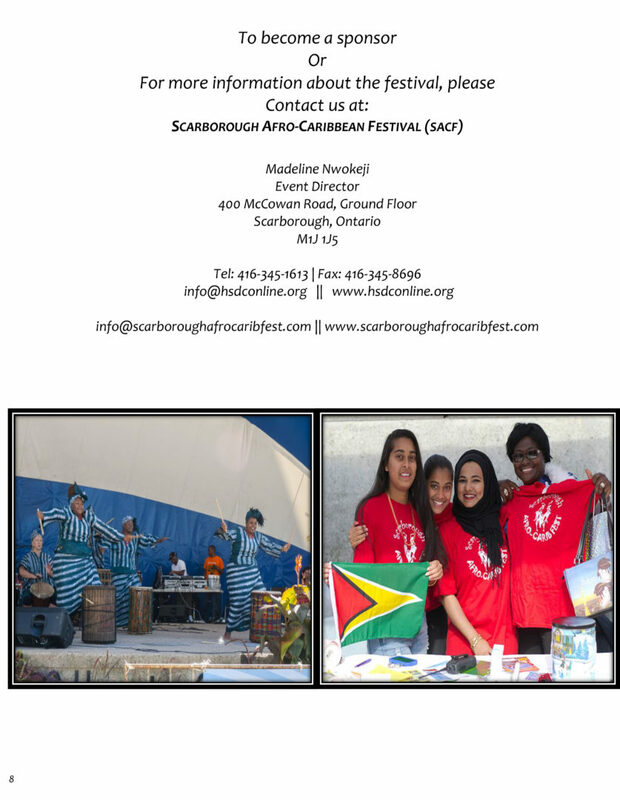 “Scarborough’s community spirit is incredible and we cannot wait to host the sixth annual event on August 26th and 27th, 2017” added HSDC’s Executive Director, Charity Lebeanya. HSDC received their award in the Excellence in Volunteer Management category, which recognizes the important work volunteer managers do to support and encourage volunteering in their communities. “It is amazing to be recognized for the work we do, and we thank the Ministry for this,” said Charity Lebeanya. “Our goal has always been to build our community and our volunteers are vital in making that happen. Events such as this remind us that there is a lot of good being done in the world and it encourages us to empower, connect and collaborate with one another”. The Ontario Ministry of Citizenship and Immigration recognizes volunteers with exceptional contributions and extraordinary leadership, innovation, and creativity to their communities and the province through voluntary action such as volunteering their time, efforts, knowledge and resources. “These amazing volunteers honour the memory of June Callwood in every action they take to improve the lives of others. It is a privilege to be able to recognize and thank them for their important work on behalf of all Ontarians.” said Citizen and Immigration Minister, Laura Albanese. About Heritage Skills Development Centre (HSDC): HSDC is a non-profit organization established in 1993 to promote the health, social, cultural, and economic self-sufficiency of new immigrants, low-income, at-risk and marginalized groups in the Greater Toronto Area. 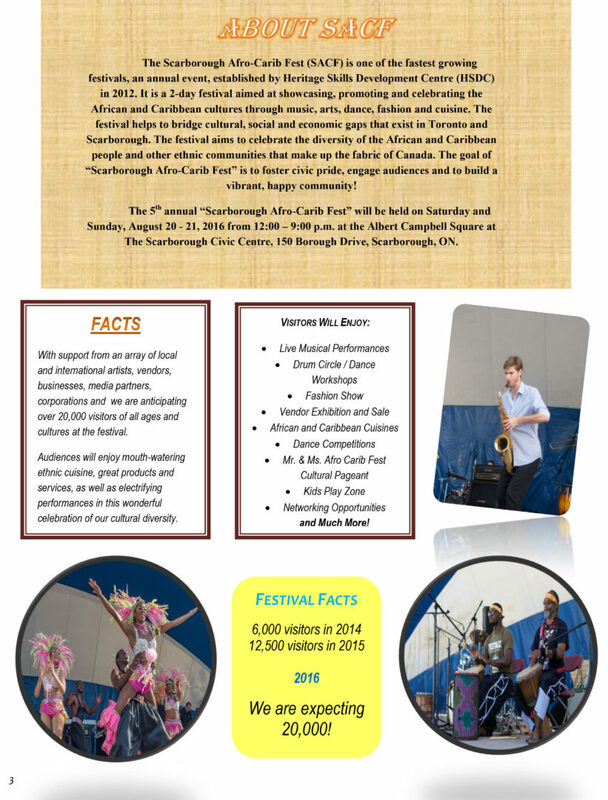 Since 2011, they have held the Scarborough Afro-Carib Fest, a uniquely Canadian festival which celebrates diversity and builds community, while bridging social, cultural and economic gaps through sharing music, dance, cuisine, arts and culture.